Update: Later on Tuesday, Apple's iCloud System Status page was updated to reflect downtime for account and sign-in, Apple ID creation, the iTunes Store, and Game Center. Some of the outages spanned more than 5 hours. The outage appeared to affect a number of iCloud-based services, including Mail, Find My iPhone, and Find My Friends. 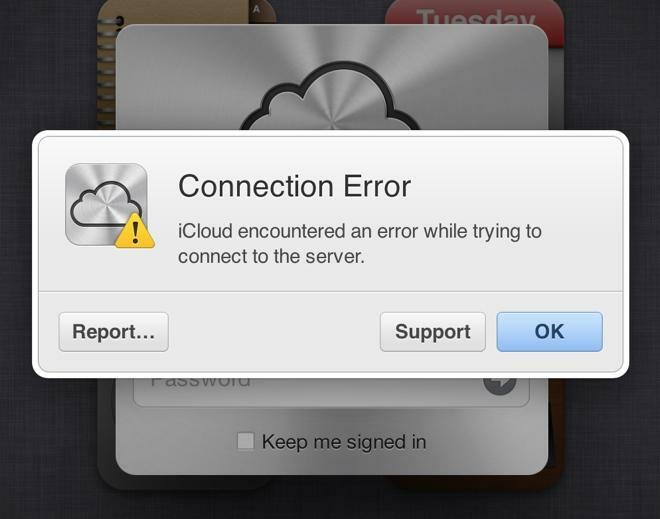 Users attempting to log in to iCloud.com were also met with a "Connection Error" message that explained that "iCloud encountered an error while trying to connect to the server." The issues appeared to be worldwide as of Tuesday morning, as readers from around the globe reached out to AppleInsider to detail their own issues. Despite the multitude of issues, Apple's iCloud System Status website claimed that all iCloud services were online and operational. No downtime was noted by the company. Issues with iCloud uptime are not new, but the company has seen a number of service outages in recent weeks. Just last Friday, its iCloud-based email service saw a 27-hour outage before operation returned to normal. A week prior, Apple's iMessage and FaceTime services saw two outages in a span of just a few days. Apple's iCloud System Status page revealed that the problem affected "some users."